Last weekend I made the trek up to Amarillo. I figured the beef capital of the world would probably be a good place to look for a good fat burger. I just love it when I am right. Following the advice of my sister-in-law and brother - I visited Boondocks. Boondocks is what some people would classify as a biker bar. To me - it just looked like a bar. No bikers that I could see although I did visit Boondocks in broad daylight... the nighttime crowd may be a little different. All I know is bikers or no bikers Boondocks lived up to every single last bit of hype from my sister-in-law and brother... Boondocks had one mean mean MEAN burger!!! 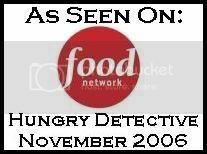 SO mean infact - it inspired me to create a brand new category to rank the burgers.... The Gravedigger. My brother ordered some cheesesticks that you can take a look at below. 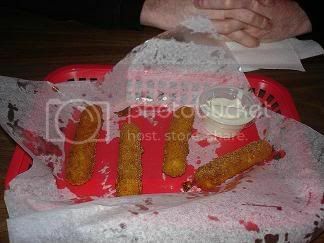 I started praying that the burger would be as greasy as the cheesesticks cause my oh my were those things dripping with grease. I was not disappointed when my Boonie Burger was delivered. 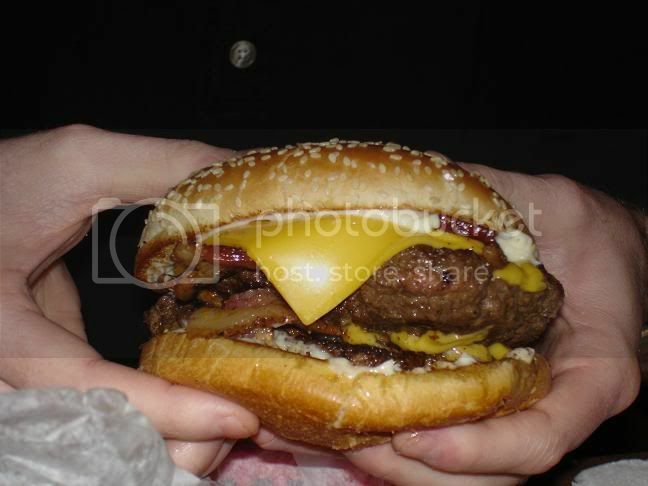 The white paper covering the burger was already starting to become transparent from the grease. The patty just shined from the oooze. This burger reminded me why I love greasy burgers... it was awesome!!! This baby had enough oooze to clog your arteries then slick your hair back. The fries were grease sticks as well. Just the way I like em!! As you can probably tell from the pictures - the Boonie Burger is a double meat burger. Granted most of the other burgers I have reviewed have all been single patty burgers. I just went and ordered what was recommended which is what I usually will do when I do my reviews. My brothers both ordered single patty burgers. I took a picture of his single patty bacon cheeseburger. It was awesome!!! Absolutely no question that both the single patty and the Boonie Burger were top notch 100% certified herd killer burgers. Only in Amarillo Texas can you find a burger the size of this thing... it was HUGE!!! It almost made me feel sorry for the herd or 2 that were slaughtered to put this beauty on my plate. Almost. 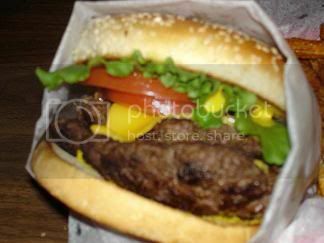 I discovered after eating the Boonie Burger that a good sized hard to handle burger can't be eaten head on.. you have to take a bite - then your other bites have to be angled off of that one because it is so big. I had to do exactly that to get this monster down. It was good though... I loved every minute of it. 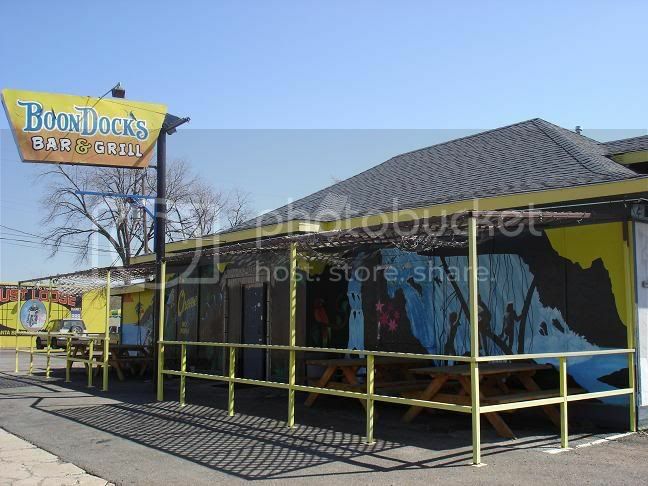 Boondocks was a one of a kind restaurant. It is actually a Bar and Grill. There are pool tables, video games, a rather loud juke box that I am sure plays country music all the time. Lots of posters and neon signs and so forth... Boondocks definitely had character... no doubt about that. The menu was good... lots of burgers that you couldn't find anywhere else. They marinate their burgers in something. I think mine was marinated in beer or something... it had an extra little flavor to it that made it unique. I can't stroll into another burger joint and find a Boonie Burger. If you can't tell already - I really did like Boondocks! We tried the cheese sticks, fries, bacon cheeseburger, regular cheeseburger, and the Boonie Burger. Man oh man... all of it was awesome! Go to Amarillo and follow the Harleys. Excellent food!!!! Excellent service!!!! One of a kind burger joint! If you are EVER in Amarillo - stop by (during the day) and get yourself a Boonie Burger! You won't be disappointed! I didn't read all of your reviews but from what I read I think you put the boondocks burger at the top of your list. Well, I'm a big burger fanatic myself and if you really want to try a big and greasy but tastey, 1-pound burger, then you need to try the "Hog burger" in Graham,TX. It consists of 2 half pound patties and cheese to ooze, separated by thick slices of hand cut ham and topped with more cheese and a number of slices of bacon. Hence the name "Hog burger". Not to mention the lettuce, onion,tomato and pickles. I have since moved to Mckinney and have yet to find anything close.I gaurentee you will enjoy, if you finish it. If you find anything better and bigger, let me know. Seriously! Oh, and if the taste and size wasn't enough to make you go back,maybe the price will. You can get the burger, fries and drink for under 6.50. I wouldn't lie about something like this. Ah yes... I go to the Boondocks regularly for lunch. Awesome Awesome AWESOME burgers! If you are taking suggestions... you ought to go to Panhandle, TX (25 miles to the east of Amarillo) and go to Buffalo Grass. You'll get yourself a great buffalo meat burger! I have to agree with you about the "Boondocks Bugers". They have some hand-crampin' cold beer also. When you make it back up here to Amarillo again, try "Arnolds" on Washington St. just north of I-40 a few blocks on the east side of the road. Ain't nothin' fancy, no frills, absolutly no atmosphere, which is the atmosphere. You can be conservative and order a regular burger that most folks have trouble finishin'. If'n you're feelin' brave you can order burgers the size of pizzas. That's right, you heard me correctly, the size of pizzas. Arnolds is family owned and has been around Amarillo for years. The women that cook your burger is just behind the counter in plan sight. The patties aren't formed perfectly, in-fact the patties aren't formed, period, and Lord only knows how much meat is in one of the regular burgers. I just know they're big (huge), meaty, tasty, juicy, greasy, and just down-right GOOD. Ya best bring a bunch of shovels!! And for desert -- Coyote Bluff on GRAND off I-40 E. Steaks and Burgers. My favorite is the Hamburger From HELL!. 1/2 lb with sauted onions and Jalapeno peppers. Truly a "Tripple Bypass Special. For lunch get there by 11:00 AM or stand outside for hours... Ice Cold Beer in a claw foot bathtub. Great review. Makes me a little homesick for my beloved Amarillo (now living in Galveston). I'd have to give a nod to the Coyote Bluff as well and of course the Golden Light Cafe's beautiful diner burger. Also, the Boonie Burger is marinated in Red Creek Marinade. For extra kick you can get a side of Red Mud sauce for your fries...or burger. The Boonie Burger IS fantastic. Everything he said is true. The SECRET is that the burger is grilled with Red Creek Marinade. I've also had a steak at the Boondocks which was marinated in Red Creek Marinade. Da Bomb!!!!!!! Plus, I met the guy who invented the marinade down at the boondocks one night. Not only does he make marinades, he also plays the hottest blues fiddle in Texas. Nice guy, too. Handed out several complimentary bottles of his marinades that night to the crowd! A trip by the Boondocks for a Boonie Burger is DEFINITELY worth it! Go see for yourself. That is the sexiest thing I've ever read in my life. It makes me want to cover my man breasts in grease and listen to some Michael Bolton. Oooh baby you've ended my celibacy. for this summer me and my family have been looking for the best burger in Texas and when i saw the pictures of the double meat burger then read the review that is were we are going. Didn't get to try the burger.. I realize you're the 'Texas' burger guy. But...if you're ever in Oklahoma you have to try a place called Meers. The burgers aren't just hand-formed, the cattle they're made from are raised on the premises and I have yet to find a burger to top them. Here's a link with directions if you're interested. Go back to Amarillo and go directly to the Golden Light on very very old 66, 6th Ave just west of downtown. THAT'S a burger! Golden Light has a decent burger, but their fries taste like they were cooked in motor oil. If you are still looking for a great burger in Amarillo, with a unique story, check out the Beef Burger Barrel on Plains Blvd between Georgia and Western. You can't miss it on the north side of the street - the building is literaly a VERY large barrel. The girls that cook at lunch during the week will make your burger any way you want it - extra grease if that's the way you want!! Plus some of the best old fashioned cherry limes around. . .
Have you been there? How does it compare? ok tbg i tried your number one pick for burgers and i have to tell you that you have horrible taste. The burgers were not only burnt to a crisp but had no flavor. the tomatos were sour and the lettuce was bad. The french fries were nearly cold and the service was horrible. Great review, but you got to try Frozen Custard Co& Grill in Corpus Christi Texas.The burgers there are out of this world, also the chicken burgers were the best.Imagine burgers and chicken burgers in 30 varieties. I pride myself in being a true burger 'conniseur'..hell, I can't spell it, but I know a good burger when I taste one...My vote for the #1 spot, is the Double/Double from a hole in the wall place in Rendon, Tx. 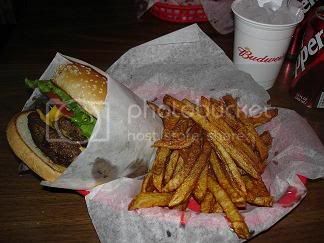 called Myrtle's Burgers...With a name like Myrtle's, its old school thru and thru..."Hot and Juicy, Ohhhh Lucy"